In this tutorial, we demonstrate how to use the HTMD code for analysing a protein folding process, in this case, of the protein Villin. Alternatively, you can download the dataset using wget. Typically waters are removed from the trajectories as they are not used in the analysis and it helps speed up further calculations. These filtered trajectories are written into a new directory. The advantage of filtering is that if your input structures only differ in the number of water molecules, you can produce a single unique pdb file for all simulations once you remove the waters, which will speed up calculations. This step is not necessary for the analysis and you can skip it if you don’t mind the slowdown in calculations. In that case replace in the following commands the fsims variable with sims. In this tutorial, in order for the trajectories to be downloaded in a timely manner, we provide only the filtered trajectories which are stored in three separate dataset folders. Therefore we will skip the above two commands and construct the simulation list directly from the filtered trajectories. To build a Markov state model we need to project the atom coordinates onto a lower dimensional space which can be used for clustering the conformations into a set of states. Here we have selected to use the carbon alpha atoms of the protein. This will calculate contacts between all carbon alpha atoms. 2018-03-20 00:19:18,232 - htmd.projections.metric - INFO - Frame step 0.10000000149011612ns was read from the trajectories. If it looks wrong, redefine it by manually setting the MetricData.fstep property. Here we provide the frame-step in nanoseconds i.e. the time that passes between two consecutive frames in a trajectory. This is automatically read from the trajectories, however not all trajectories contain the correct fstep so it can be useful to manually define it like here. 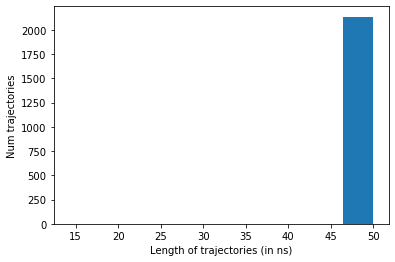 Sometimes the set of trajectories can contain trajectories of incorrect length. These are typically corrupted trajectories and are removed. dropTraj has multiple options for removing simulations from the dataset. Here we use it to remove all trajectories whose length is not equal to the mode length. 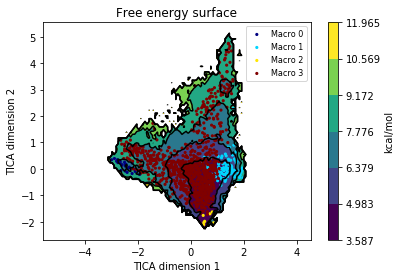 TICA is a method that can be used to improve the clustering of the conformations. This is done by projecting the data onto a lower-dimensional space which separates well the metastable minima and places clusters on the transition regions. /home/joao/maindisk/SANDBOX/miniconda3/miniconda3/lib/python3.6/site-packages/pyemma/__init__.py:91: UserWarning: You are not using the latest release of PyEMMA. Latest is 2.5.1, you have 2.4. If we want to bootstrap our calculations we can at this point drop a random 20% of the trajectories and do the rest of the analysis multiple times to see if the results are consistent. Alternatively we can keep on using dataTica in the following commands. Once we have cleaned the dataset we proceed to cluster the conformations. 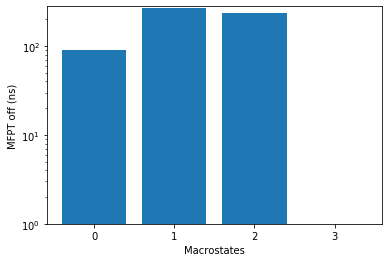 Here we use the mini-batch kmeans clustering algorithm to produce 1000 clusters. 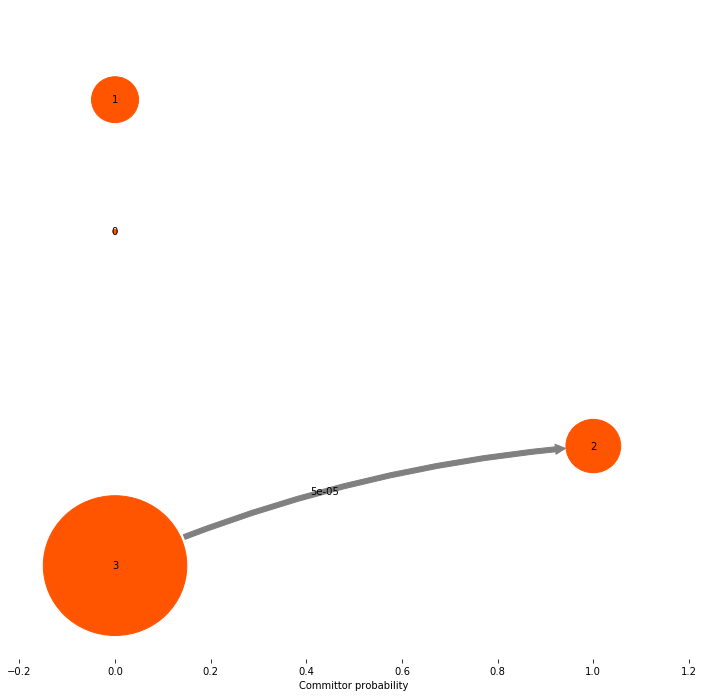 After clustering it is time to build the Markov model. Before constructing the Markov model we need to choose the lag-time at which it will be built. The lag-time is typically chosen by looking at the implied timescale (ITS) plot and selecting a lag-time at which the top timescales start converging. 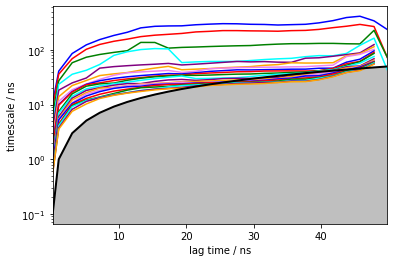 By constructing Markov models at various lag times HTMD creates a plot which shows the slowest implied timescales of each Markov model at various lag times. If a model is Markovian at a specific lag time, the implied timescales should stay unchanged for any higher lag times. Therefore, given an implied timescales plot, the user can monitor the convergence and choose the lag time at which to construct his Markov model, typically the Markov time which is the shortest lag time at which the timescales converge. Too large lag times can reduce the temporal resolution of the Markov model and can create more statistical uncertainty due to fewer transition counts and thus instability in the implied timescales. After seeing the ITS plot we decide on a lag-time of 25ns. Additionally the ITS plot showed us that there is a separation between 3 slow timescales and the rest of the timescales which are fast. 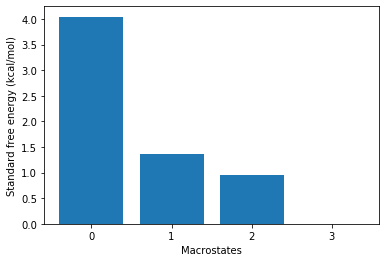 Therefore we choose to lump our microstates together into 4 macrostates. Once we have a Markov model we can plot the free energy surface by projecting it on any of our projected coordinates. For example to plot it on the first two TICA coordinates we call it like this. /home/joao/maindisk/software/repos/Acellera/htmd/htmd/metricdata.py:786: MatplotlibDeprecationWarning: The griddata function was deprecated in version 2.2. To see what the states look like we can use the viewStates method. 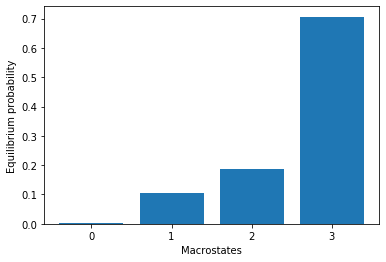 We load the macrostates and add a protein representation. 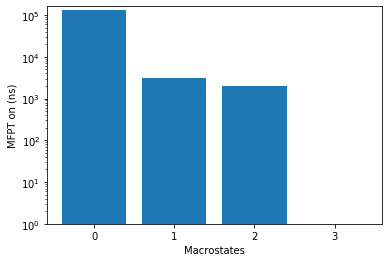 One of the major advantages of Markov state models is that they can provide quantitative results about the kinetics between states. Provide the Kinetics constructor with the system temperature. It automatically then calculates the source and sink states. 2018-03-20 00:36:49,155 - htmd.kinetics - INFO - Guessing the source state as the state with minimum contacts. To see the rates between the source and sink states we use the getRates method. 2018-03-20 00:37:08,689 - htmd.kinetics - INFO - Calculating rates between source:  and sink:  states. To plot the free energies and mean first passage times of all state use the plotRates() method. "matplotlib is currently using a non-GUI backend, "
And this concludes the protein folding tutorial.